A mystifying and memorable collection of original songs combining world sounds (Indian, Celtic, etc.) with strong pop sensibilities and a passionate, soulful voice sure to keep the curiosity piqued, the heart open and the body moving. Growing up with an English mother and Brooklynese father (dare we say wry on rye), itâ€™s no wonder the music and vocalizations of Esther Valentine are eclectic and refreshingly original. With her three-octave range, distinctive voice and songs, she can sound sweet then smoky (sheâ€™s been described as the voice of an angel with the sound of the street), â€œtroubadorianâ€ with a hint of Coney Island Blues, banshee-like, cantor-like, but unlike anything youâ€™ve heard before â€“ though somehow familiar. Her latest release, the searching and soulful â€œMissing Mantraâ€ illustrates this versatility and range beautifully. Ms. Valentine collaborated with producers, arrangers, writers and performers, many of whom are friends, and the outcome is an enchanting, thought-provoking and unique blend of songs sure to keep the curiosity piqued, the heart open and the body moving. For the title cut, â€œMissing Mantra,â€ Esther collaborated with Tushar & Suchita Parte, a talented couple from Mumbai (Bombay) who hail from a sort of musical Indian aristocracy, though they are down to earth and really quite humorous. Esther and the Parteâ€™s developed a mutual admiration via cyberspace and decided to meet face to face (the Parteâ€™s traveled to America). Esther wrote, performed and produced the American tracks for â€œMissing Mantra while Tushar produced the Indian arrangements in Mumbai using an array of lush, Indian instruments and sounds including sitar, tablahs, swarmandal, bansuri and Suchitaâ€™s beautiful voice singing ragas and shlokas. He also played lap & electric guitar (heâ€™s a masterful guitar player who also loves bluegrass!) Paul Livingstone, a noted guitar/sitar player in L.A., also added some signature sitar parts in Los Angeles. â€œNovgorodâ€ is a cyber-sea miracle/masterpiece. Esther and the hot and spicy Norwegian band â€œGazpachoâ€ also discovered each other via the web, joined â€œthe mutual admiration society,â€ then set to work on this lush, moving, and rocking homage to the classical Russian composer, Rimsky-Korsakov (which was originally released on their compelling CD â€œBravoâ€ - they are also on CDBaby). This collaboration, which includes writing, production and performance, was accomplished all via Internet! Numerous music and text files were fervently e-mailed, as they poetized back and forth, basing the lyric on the myth of the sea siren and her unsuspecting prey, a lonely musician banished to the edge of the world. The result will keep you on the edge of your seat. â€œFalse Profitâ€ has also been getting rave reviews. Ms. Valentine teamed up with Gregg Montante, a fine producer and powerful guitar player who has scored and played on numerous films (U.S.A. channel, etc. ), and who has completed numerous CDâ€™s of his own. He added a somewhat jazzy Bond/Krall/Raitt feel and ironically, a smokiness to this tune about trying to kick the tobacco habit. â€œGive Me A Reasonâ€ was written by Esther Valentine and David Barkley, an accomplished and accredited composer/orchestrator who seems to have mastered the art of combining mood and ambience with light and excitement. The result is a tender yet powerful Celtic/country/R&B original. Having grown up around a bit of English music hall (Estherâ€™s mother was from Manchester), and â€œmusedâ€ by David Collins (rhythm guitar on â€œâ€¦Mantraâ€ and several others) to cover some of the haunting ballads of yesteryear, Esther also includes a rendition of the 1918 song, â€œIâ€™m Always Chasing Rainbows,â€ which she produced, performed and arranged herself. It is a beautiful and poignant song, originally adapted from Chopinâ€™s Fantaste Impromptu. This arrangement was also partly inspired by Eva Cassidy. â€œPeace, Nowâ€ is an impromptu jam with the Parteâ€™s when they were visiting from Mumbai. It was originally a response to 9/11. Esther adapted the poem into a song a few years later then added her unique, signature harmonies. Angel Song is a promo/bonus track that was recorded a few years previous, (produced by Esther and John Boegholde), which has had quite an impact on her listeners. 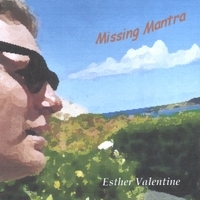 Please visit esthervalentine.com for more information, and/or to purchase â€œMissing Mantraâ€ separately. Dance and be joyful is the essence of Esther Valentineâ€™s CD, entitled "Canâ€™t Watch Yourself Dance." Though you may see a storm cloud overhead, or find yourself pressed with the usual rigors of being mortal, why not grab the brass ring of the day, in spite of it all? If that's not enough, and you simply must have more, "Anthology" is also a favorite (extended Esther), and "Angel Song" is another uplifting compilation available on Estherâ€™s site, and to be posted shortly on CDBaby. Esther has also worked with, amongst others, David Kershenbaum, (prod., Tracy Chapman), Paul Buckmaster (arr. Elton John, Bowie), Richard Burgess (keyboard prog., Kate Bush), and Marc Tanner (Sean Colvin). She had a song on a Gold (CBS) CD, and has numerous film and television credits including â€œThe Shield.â€ Her work appeared on a CD that included Bernie Taupin, Holly Knight, as well as other fine writers. Additionally, Esther has appeared as a guest vocalist on numerous CD's, including a compilation with "The Young Dubliners," and also wrote, arranged and vocalized on a group of ambient CD's/releases, one of which was in heavy rotation on the BBC. She has also vocalized/composed for several national commercials and accepted an award in Nashville for her artistry. Esther's music has become a part of our lives since we were introduced to during her visit to Cornwall. We pipe the wonderfully haunting sounds of 'Missing Mantra' and 'Can't Watch Yourself Dance' over our guests as they enjoy breakfast at our B&B in Cornwall, England - our guests love it! Our favourite track is 'Give Me A Reason'. Ms. Valentine's latest CD entitled "Missing Mantra" is a tapestry of wonderful artistry. The title song "Missing Mantra" displays Ms. Valentine's sensitivity and artistry of lyric and melody that leaves me thinking she is one of the great songwriters in our era. She even takes a standard song like "I'm Always Chasing Rainbows" and rather than give us a rendition that is by the book or predictable, she provides us with a rendition of her own. Her own sound, style, and point of view on a song written in 1918, breathes new life through the dust. Her gifted voice is one of the best of all times, and it allows her to cover a broad range of styles without ever sounding phoney or ill at ease. Two Esther Valentine CDs are currently available in a single package: "Missing Mantra," the 2005/2006 release, and "Can't Watch Yourself Dance." (You can also buy them separately at her web site, www.esthervalentine.com.) Both are remarkable, both contain some fine singing and some interesting, complex arrangements, but "Missing Mantra" made me want to rethink singing altogether. The next song, “Novgorod,” is an internet collaboration with the Norwegian band, Gazpacho, and an homage to Rimsky-Korsakov. (It is also a reminder of how deeply mysticism is a part of Valentine’s Russian heritage.) In this song, Self is understood as multiple, many-voiced, and the voice is never really differentiated from instrumental sound. (The instrumental tracks & male vocal were beautifully produced by "Gazpacho.") The dense, layered, textured quality of these pieces perhaps arises out of some developments from the 1960s and 70s: John Lennon’s “I Am the Walrus,” for instance. (The song "False Profit" on Valentine’s CD was “inspired by J. Lennon, G. Harrison, David Beatle….”) Valentine's remarkable voice brings us into another realm altogether. "Can’t Watch Yourself Dance" also has many fine pieces. As "Missing Mantra" has an exquisite version of the Harry Carroll/Joseph McCarthy song, “I’m Always Chasing Rainbows”—introduced by vaudevillians Harry Fox and the Dolly Sisters in 1918—so "Can’t Watch Yourself Dance" has a beautiful version of John Dowland’s “If My Complaints Your Passions Move,” part of the “exquisitely sorrowful music” written in England in the sixteenth and seventeenth centuries. Comes on occasion a feeler—a thinker who, during moments of magic, presents precious gifts for seekers of meaning and beauty. Your lyrical prowess has grown with time, and it is indeed rewarding to travel through the many engaging thoughts and emotions expressed by your music. No coward you who dares engage dragons of social injustice and sordid pretence. Be well, Valentine. May life forever know an evolution unto a universe all sane and lovingly serious about preserving our precious planet that is too often abused by blind indifference? A wonderfull acoustic experience to unwind to. Esther has a wonderfull range and a beautiful haunting voice that is compulsive listening. Both Missing Mantra and Can't Watch Yourself Dance are amongst the most played in our collection.